Many of us have seen the slick advertisements on television for reverse mortgages. An actor who is popular with our seniors will advocate the advertiser’s reverse mortgage program as a way to tap home equity and enjoy the “good life”, the long awaited vacation or purchase of a new car or boat. However, the reality of reverse mortgages can be quite contrary to these advertisements. A reverse mortgage is a home equity mortgage program only available to homeowners over the age of 62. These mortgages are insured by the Federal Housing Administration, a division of the Department of Housing and Urban Development. A portion of the home equity is made available for the loan, which proceeds are distributed in several ways. The homeowner can receive the proceeds in (1) monthly installments for so long as he lives in the house, (2) monthly installments for a set period of years or (3) as a line of credit that can be used as needed. Unlike a conventional mortgage, a reverse mortgage does not need to be paid until the borrower dies or no longer occupies the home as his primary residence. Not needing to make a monthly payment while having funds available for home improvements, medical expenses or other retirement needs is obviously highly attractive to seniors. However, this author wishes to demonstrate particular concerns with respect to reverse mortgages that have actually been experienced by some of her clients. 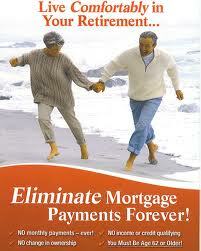 A reverse mortgage borrower must be at least 62 years of age. Let us consider a married couple that jointly owns their home, the wife is 57 and the husband is 63, meaning that only the husband can become the borrower. If the husband dies first, the surviving widow will be unlikely to repay the loan which is now due in full (without selling the house in which she may wish to continue living). The primary residence requirement may also cause difficulties. If the borrower needs to live in a residential care facility indefinitely due to medical issues, the loan will be due in full and the borrower will be unlikely to have the funds to repay. Of course, once the borrower dies, triggering the due in full provision, the lender may not patiently await receipt of the house sale proceeds needed to repay the loan and may commence a foreclosure or other legal proceeding. After the financial crisis of 2008, homes have not sold as readily as in the past, making it more difficult for survivors to sell homes to satisfy the reverse mortgage lender’s schedule. Further, with home values having dropped in recent years, there may be insufficient proceeds from the house sale to pay the loan, making the balance due from the estate. The New York Times recently reported another troubling aspect of reverse mortgages. Borrowers typically are not submitted to financial review and credit scores are not evaluated. In addition, lenders have not confirmed that the borrower has sufficient reserves to pay property taxes and insurance. The inability to pay property taxes is a red flag as to the borrower’s ability to pay her expenses and puts the property at high risk for foreclosure. Although the mortgage is not repayable until certain events occur, real estate tax defaults can result in tax liens and foreclosures. The cursory review given to the loans reminds us of subprime loans which were at the heart of the financial crisis of 2008, where any borrower who had a pulse qualified for a loan. Proponents of reverse mortgages argue that the younger homeowner “can always refinance” after the death of the older spouse. However, with banks’ tightening lending standards, one cannot safely project that refinancing will always be an option for them. Our attorneys assist clients through the loan process. We evaluate proposed loan programs, considering potential estate concerns, as well as manage the loan repayment requirements after the death of the borrower. Our firm is also experienced in the negotiation of payment terms and foreclosure defense.